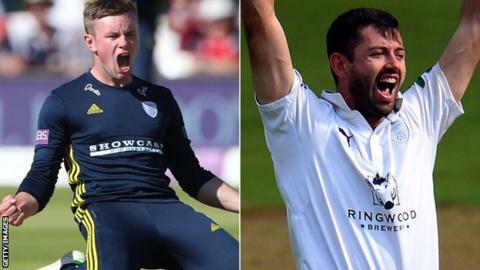 Leg-spinner Mason Crane and all-rounder Ian Holland have agreed extended contracts with Hampshire. Crane, 22, endured an injury-disrupted 2018 season with a stress fracture of the back shortly after making his England Test debut. "I was disappointed not to play much last year, but to get a new deal and commit my future to this club is great," Crane told BBC Radio Solent. USA-born Holland, 28, made his Hampshire debut in June 2017. Both players' previous contracts were due to end at the conclusion of the 2019 season. Injuries restricted Crane to just eight appearances in the One-Day Cup last season, including taking 1-53 as Hampshire beat Kent in the final at Lord's in June. The setback came just five months after he was played in the final Ashes Test at Sydney. "It was devastating to miss so much cricket last season," he said. "It's been a great pre-season and I'm hoping I can play a vital part this season in all three formats. "If the season had started yesterday, I'd have been fit to play." Holland, a UK passport holder through his English father, grew up in Australia and previously played for Victoria before his switch to county cricket. He earned his Victoria contract after winning television series Cricket Superstar in 2012.